Financial calculators and health calculators are great self screening and self education tools. Use online financial calculators to find out how much your mortgage payments, auto payments, or any loan payment will be. Find out how much you can afford to pay for a house or car before talking to a realtor or car salesman! You can create a plan to get your debts paid off quickly too. Use online health calculators to learn more about your personal health and how to make safe, effective changes in your fitness, exercise, and nutrition habits to improve your overall health. 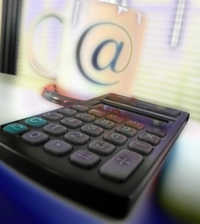 We offer online calculators to service almost every industry. If you don't see a calculator you need, a detailed description of what you need and we may add it. Not looking for online calculators? Check out our full list of online assessments for health and parenting. How old will I be on a given date? Will you be old enough to take Driver's Ed when the class starts next term? Or will you qualify to begin drawing retirement funds by the date you plan to retire? Enter your birthdate and any other date and this calculator will tell you exactly how old you will be on that date and how long before that date gets here. Calculate the monthly payments for a mortgage loan. Enter your sale price, any down payment you're making, the interest rate and the term of the loan. This calculator will then show you the monthly principal and interest payment, the total amount of interest you will pay and the total amount of money you will spend over the life of the loan. You can also enter the points and other closing costs and roll those into your loan. You can even enter an additional payment amount you intend to pay each month to work down your principal and the calculator will show you the anticipated payoff time. You can display and/or print the amortization schedule for your loan. Help me compare mortgages with different terms. Calculate and compare (formatted side by side) the monthly payments for up to 4 mortgage loans. Enter your sale price, any down payment you're making, the interest rate and the term of each loan. This calculator will then show you the monthly principal and interest payment, the total amount of interest you will pay and the total amount of money you will spend over the life of each loan. You can also enter the points and other closing costs and roll those into your loans. You can even enter an additional payment amount you intend to pay each month to work down your principal and the calculator will show you the anticipated payoff time. What date will I turn a specific age? What date will you turn 59 and a half, the age you can begin drawing from your retirement funds? Or what date will you turn 15 and 9 months so you can take Driver's Ed? Enter your birthdate and the age you want to know about and this calculator will tell you the date you will be that age and how long before that date gets here. Find out what the date will be so many days, weeks, months or years in the future. You can find the exact future date when your purchase return period ends or the warranty expires. How much might my payments be with an adjustable rate mortgage? Calculate the monthly payments for an adjustable rate mortgage (A.R.M.) loan. Note that this calculator is designed to show you the worst case scenario or maximum possible payout for an A.R.M., which is not likely to actually happen. The calculator has the interest rate always go up after the minimum length between steps and it always goes up the maximum step percent until the interest rate reaches the maximum. Enter your sale price and any down payment you're making. Then enter the initial fixed interest rate and the guaranteed fixed rate length, the maximum interest rate adjustment and the minimum length of time between adjustments, and the maximum interest rate for the loan. Also enter the length of the entire loan. This calculator will then show you the initial fixed rate monthly principal and interest payment, your maximum monthly principal and interest payment, the total amount of interest you will pay and the total amount of money you will spend over the life of the loan. You can also enter the points and other closing costs and roll those into your loan. You can even enter an additional payment amount you intend to pay each month to work down your principal and the calculator will show you the anticipated payoff time. You can display and/or print the amortization schedule for your loan. Help me compare adjustable rate mortgages with different terms. Calculate and compare (formatted side by side) the monthly payments for up to 4 adjustable rate mortgage loans. The calculator has the interest rate always go up after the minimum length between steps and it always goes up the maximum step percent until the interest rate reaches the maximum. Therefore, this calculator is designed to show you the worst case scenario or maximum possible payout for an A.R.M., which is not likely to actually happen. Enter your sale price, any down payment you're making, the initial fixed interest rate and the guaranteed fixed rate length, the maximum interest rate adjustment and the minimum length of time between adjustments, the maximum interest rate and the entire length of each loan. This calculator will then show you the initial fixed rate monthly principal and interest payment, your maximum monthly principal and interest payment, the total amount of interest you will pay and the total amount of money you will spend over the life of each loan. You can also enter the points and other closing costs and roll those into your loans. You can even enter an additional payment amount you intend to pay each month to work down your principal and the calculator will show you the anticipated payoff time. How much will my payments be with a true bi-weekly mortgage loan? Calculate the payment amount for a bi-weekly (every 2 weeks) mortgage loan. Bi-Weekly mortgages may work well if you get paid every 2 weeks (i.e. every other Friday) and want to make a payment on your home each payday instead of just once a month. Note that this is a true bi-weekly calculation amortized over the length entered. It is not necessarily the same as paying half a monthly mortgage payment every 2 weeks, which would pay the loan sooner than its original length. Enter your sale price, any down payment you're making, the interest rate and the length of the loan. This calculator will then show you the bi-weekly principal and interest payment, the total amount of interest you will pay and the total amount of money you will spend over the life of the loan. You can also enter the points and other closing costs and roll those into your loan. You can even enter an additional payment amount you intend to add to each bi-weekly payment to work down your principal and the calculator will show you the anticipated payoff time. You can display and/or print the amortization schedule for your loan. Help me compare bi-weekly mortgages with different terms. Calculate and compare (formatted side by side) the payment amounts for up to 4 bi-weekly mortgage loans. Enter your sale price, any down payment you're making, the interest rate and the term of each loan. This calculator will then show you the bi-weekly principal and interest payment, the total amount of interest you will pay and the total amount of money you will spend over the life of each loan. You can also enter the points and other closing costs and roll those into your loans. You can even enter an additional amount you intend to add to each payment to work down your principal and the calculator will show you the anticipated payoff time. How much will my payments be with an interest-only mortgage? Calculate the payment amount for an interest-only mortgage loan. An interest-only loan pays no principal in the early years of the loan then converts to a traditional amortized loan for the remainder of the mortgage length. The payments are lower during the interest-only period since no principal is being paid. The payment goes up sharply after the interest-only period since you must pay the balance of principal plus interest during the remaining loan years. Enter your sale price, any down payment you're making, the length of the loan, and the points and closing costs. Then enter the interest rates, lengths, and any additional principal amounts you plan to pay each month for the interest-only and amortized periods of the loan. This calculator will then show you the monthly payment amounts for the interest-only and amortized periods. It will also calculate the total amount of interest you will pay, the total amount of money you will spend over the life of the loan, and the anticipated payoff time. You can also display and/or print the full amortization schedule for your loan. How much will my monthly payments and payoff amount be with a balloon mortgage? Calculate the monthly payments for a balloon mortgage loan. Enter your sale price, any down payment you're making, the interest rate, the length of balloon payments, and the amortized length used to calculate the monthly payment. This calculator will then show you the monthly principal and interest payment, the final balloon payment amount, the total amount of interest you will pay and the total amount of money you will spend over the life of the loan. You can also enter the points and other closing costs and roll those into your loan. You can even enter an additional payment amount you intend to pay each month to work down your principal to reduce the final balloon payment amount. You can display and/or print the amortization schedule for your loan. Help me compare balloon mortgages with different terms. Calculate and compare (formatted side by side) the monthly payments and final balloon payment amount for up to 4 balloon mortgage loans. Enter your sale price, any down payment you're making, the interest rate, the length of balloon payments, and the amortized length used to calculate the monthly payment. This calculator will then show you the monthly principal and interest payment, the final balloon payment amount, the total amount of interest you will pay and the total amount of money you will spend over the life of each loan. You can also enter the points and other closing costs and roll those into your loans. You can even enter an additional payment amount you intend to pay each month to work down your principal to reduce the final balloon payment amount. Use this calculator to help you determine the most expensive house you would qualify for. Enter your monthly income, all monthly debt expenses (credit card payments, car payments, loan payments, and any other expenses), and information about your mortgage (down payment amount, loan term, interest rate, property tax rate, private mortgage insurance (PMI), and monthly association dues). This calculator will then show you the highest monthly payment you can afford and the highest priced home you can afford to keep your total monthly housing expenses less than 28% and your debt ratio less than 36% of your total gross monthly income. In general, most lenders do not want your total monthly housing expenses (including property taxes, private mortgage insurance (PMI), and association dues) to exceed 28% of your total gross monthly income. And your total debt ratio cannot exceed 36% of your total gross monthly income. I'm interested in paying off my mortgage early, how much additional should I pay each month to pay off my home by the time I choose? How much additional would you need to pay each month to pay off a home mortgage in a certain number of years and months? Run this calculator to find out your mortgage early payoff time. Enter your mortgage balance, the principal and interest amount of your current monthly payment, the interest rate, and the desired number of years and months to pay off the home and this Mortgage Early Payoff calculator will show you how much additional you must pay each month to meet that payoff time. It also shows how much time and money you will save by paying off the mortgage early vs. paying as scheduled. How will my existing mortgage be affected if I make extra mortgage payments to pay down the mortgage? How long have I been paying my mortgage? How much have I paid and how much more remains? Are you paying on a loan and wondering how long you've been paying or how much longer you'll be paying? Just enter your loan balance, interest rate, the original length of the loan, and the current monthly payment and this calculator will show you how long you've been paying and the remaining time to payoff, as well as how much interest and the total paid so far and how much interest and the total remaining to be paid. What is my debt to income ratio or debt ratio? Calculate your debt to income ratio or what percentage of your monthly income is used to pay fixed monthly costs. Enter your monthly income, monthly rent or mortgage expense, and other monthly expenses. This calculator will then show you your debt to income ratio which is the percentage your monthly income goes to pay monthly debts and expenses. In general, most mortgage lenders do not want your total monthly housing debt ratio or housing expenses (including property taxes, private mortgage insurance (PMI), and association dues) to exceed 28% of your total gross monthly income. And your total debt to income ratio percentage cannot exceed 36% of your total gross monthly income. Compare up to 4 loans side by side with this calculator. Enter the loan amount, interest rate, and term of each loan and this calculator will show you the payment amount, the total interest you will pay, and the actual cost for each loan. You can also enter any additional principal amount you intend to pay each month and the calculator will show you each loan's anticipated payoff time. This is a very simple loan payment calculator. Enter the loan amount, interest rate, and length of the loan into this calculator and it will show you the monthly payment amount. An advertisement shows you the monthly payment amount and how long you'll pay that amount. And you can find the interest rate in the fine print at the bottom of the ad. But the actual price or loan amount is never mentioned. Sound familiar? Enter the monthly payment amount, the interest rate, and length of the loan into this calculator and it will show you the loan amount. Need to find out the interest rate for a loan? Enter the loan amount, monthly payment amount, and the length of a loan into this calculator and it will show you the interest rate being charged. Help me compare auto loans with different terms. Calculate and compare (formatted side by side) the payment amounts for up to 4 auto loans. Use this calculator to help compare interest rates or see the effect of putting more money as a down payment. This calculator is also good for comparing lower-interest deals with cash back offers. ("Should I take the cash rebate and get a loan with a higher interest rate?") You can also see quickly what happens if you apply your trade-in and/or dealer rebate to the down payment or pocket it for something else. What auto price should I be looking for? Before you go shopping for a new car, use this calculator to help you determine the sticker price you should be looking for. Enter the maximum monthly payment you can afford, the sales tax percentage you will pay on the new vehicle, and other charges that will be financed, like tags and registration, or dealer prep and delivery charges. Then enter any cash, trade-in, and dealer rebates that you will use as a down payment and the interest rate and length of the loan you are considering. This calculator will then show you the maximum vehicle price and the loan amount that will keep your payments close to what you entered. I have an auto loan pay off goal and want to see how fast making larger payments can payoff the auto loan and how much interest I can save. I have an auto loan payoff goal and want to see how fast making larger payments can pay off the auto loan and how much interest I can save. How long have I been paying my auto loan? How much have I paid and how much more remains? How much will my auto lease payments be? Help me compare auto lease payments with different terms. Calculate and compare (formatted side by side) the payment amounts for up to 4 auto leases. Use this calculator to help compare different cars, down payments amounts, negotiated prices, or lease lengths. Am I likely to exceed my lease mileage and how much will that cost me? Find how if you are likely to drive more miles than your lease allows and how much you will have to pay for the excess miles when the lease ends. Enter the annual miles allowed, the charge for excess miles as stated in your lease, and car's current odometer reading and this calculator will project excess miles and anticipated charges at lease end. You can also see how to adjust your driving for the remainder of the lease to avoid going over the allowed miles and paying a mileage charge. How should my payments be set up to lower debt the quickest? Will my payments really be lower if I'm paying debt with debt by consolidating loans? Should I Get a Debt Consolidation Loan? Getting more loans to pay debt or paying debt with debt is a good debt restructuring answer for some individual situations and not for others. Do your homework before deciding. Enter your debt balances and the basic information about your consolidation loan and this calculator will show you the monthly payment and other important information to help you decide if this loan is right for your situation. You can even enter any additional amount you are considering borrowing and any additional principal you will pay each month to pay the loan off faster. Show the amortization schedule to see the month-by-month payment breakdown. The numbers should help you see if a consolidation loan for debt restructuring will actually lower your monthly payments or save you interest. Think Debt Advice - Debt tools, calculators, information and advice to help you find the best solutions to your debt problems. Think Debt Advice also provide debt solutions such as debt consolidation loans, debt management and IVAs. Should I use extra money to pay down debt immediately or invest it until there's enough to pay off the debt at once? See if it's better to pay down debt or invest your extra money until it can pay off the debt all at once. Will you pay more interest on your loan or earn more on your investment? Enter the information about your debt and investment and this calculator will show you how to lower debt the faster by showing what happens if you pay down debt first or put it into an investment until it grows to the pay off debt amount. Are my financial habits going to lead to financial trouble? What is my body mass index (BMI) and BMI classification? This BMI calculator will help you determine your approximate Body Mass Index (BMI), which is a measure of body fat and helps determine if your heart and cardiovascular system may be overworked. Just enter your weight and height to calculate your BMI, BMI classification, and the weight range for the classification. What do my waist and hip size indicate about my risk of heart disease? How much is it costing me to smoke? Smoking cigarettes can be an expensive habit. Use this calculator to see how much cigarettes are costing you each day, week, month, year, or over your lifetime. Of course, if you want to quit smoking these costs represent the money you could save. What is my navy fitness level when measuring body fat using the Navy Body Fat Test and Navy Body Fat Chart? This Body Fat Navy Calculator uses the U.S. Navy fitness formula to get an estimated measuring of body fat percent. Use a tape measure then enter your waist, hip, and neck measurements. Combine these measurements with your gender and height and this navy calculator will estimate body fat percent, lean mass, fat mass, and your general navy fitness category. (You can see the Navy Body Fat Chart by clicking the down arrow icon right under the results.) The water displacement test is the most accurate way to determine body fat percent, but the Navy Body Fat test or YMCA formula is accurate within 1-3% for most people. How many calories should I eat each day to maintain my weight? Your resting metabolism (RMR) (also known as basal metabolism or BRM) is the minimum calories you burn each day for your body to keep everything functioning. The simplest RMR formula, used by this calculator, requires just gender and weight. This formula was developed by Dr. Fred Hatfield of the International Sports Sciences Association and is fairly accurate if your body fat is in the normal range (14-19% for men, 20-25% for women). If your body fat is substantially higher than normal, this formula will overestimate your RMR. How many of my daily calories should come from fat, protein, total carbohydrates, fiber and sugars to maintain balanced eating? To maintain a balanced eating routine, you need to know where your daily calories should come from. Enter your gender and your daily calorie intake and this calculator will show you how many of your daily calories should come from fat, protein, fiber, sugars, and total carbohydrates. What affect does fiber have on my ability to lose or maintain my weight? People watching their weight often increase their fiber intake. Fiber has many benefits as part of your diet, one of which is that fiber absorbs calories. While increasing daily fiber intake is only one piece of the weight loss equation, this calculator will show how long it will take to lose weight if increasing fiber is the only diet change you make.